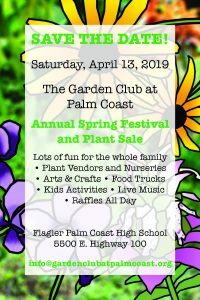 The Garden Club at Palm Coast is organizing the 2019 Spring Festival and Plant Sale, scheduled for Saturday, April 13, 2019. The Festival will take place at the Flagler Palm Coast High School, 5500 E Highway 100, Palm Coast, FL. Members of the Garden Club at Palm Coast are busy working on the organization of the 2019 Spring Festival and Plant Sale. More volunteers are needed!! Each committee is managed by one or several chairpersons. Please open the document Chair-Persons to see who is responsible for each committee. You will also notice that in the current version of the Chair Person list there currently are no open slots, but additional volunteers are always welcome. Please volunteer for a role that attracts/suits you and submit your name to the organization via the club email address: Info@GardenClubAtPalmCoast.ORG . Going forward Club Members will find a growing wealth of information and instructions for their roles on this page. Please visit this page regularly and stay informed.